Also known as Cathedral Falls, which the current owners have renamed this cascade. 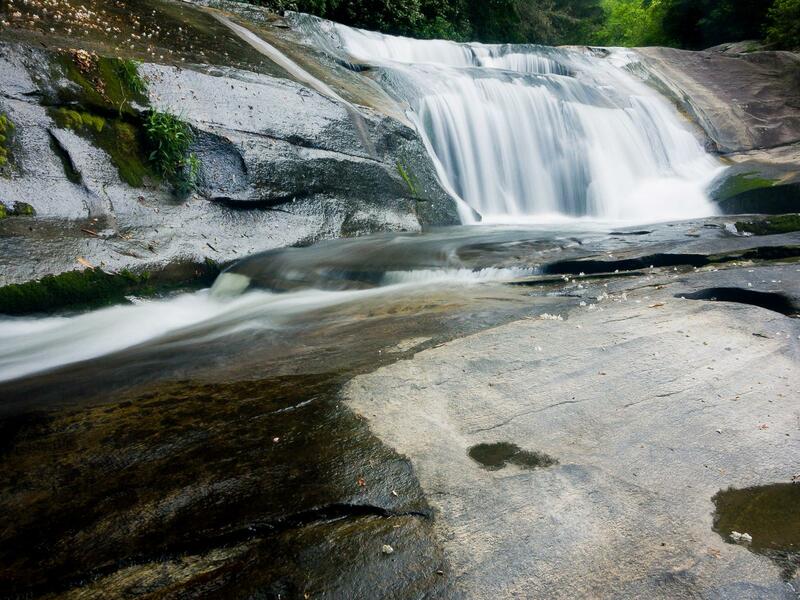 It's located below some other scenic falls and cascades on a section of the North Fork French Broad River. The falls is nice, but it's most notable for the huge, imposing bluff that the river has carved into here. It's a spectacular place. To add to it, during very wet weather, another high, very thin tributary stream pours off the cliff face and onto the rocks, forming an ephemeral waterfall. From the intersection of NC Hwy. 215 and US Hwy. 64 near Rosman, follow NC 215 North about 7 1/2 miles. Look for the parking pull off on the left - it's just past Round House Drive (private) and there are some boulders placed at the trailhead. Go down the steep path to the gentler path below, and turn left. Hike a short distance downstream over a trail with lots of steps and bridges, which comes out on the wide rock area above the falls. Another path curves around to the base. Keep in mind that this is private property and the owners graciously have allowed the public to visit. Show your utmost respect to this fact, and the land. Also, people have died here - recently - so stay away from the top of the waterfalls.